Aluminium Specialist Aluminium windows, aluminium french doors, folding doors, patio doors, shopfronts, enclosures, skylights, shower doors, security gates, burglar guards. 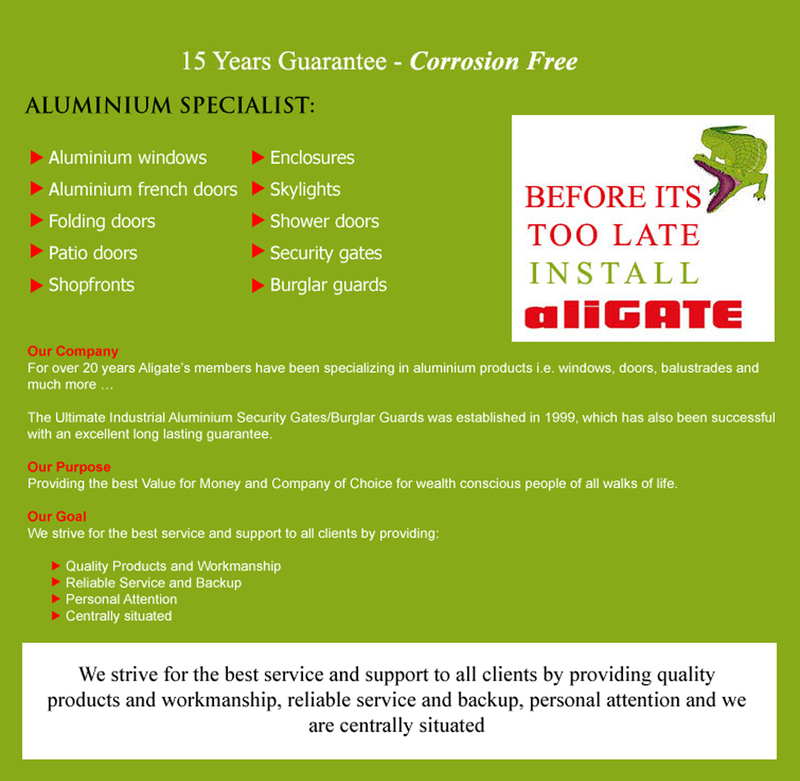 Our Company For over 20 years, Aligate's members have been specializing in aluminium products i.e. windows, doors, balustrades and much more... The Ultimate Industrial Aluminium Security Gates/Burglar Guards was established in 1999, which has also been successful with an excellent long lasting guarantee. Our Purpose Providing the best Value for Money and Company of Choice for wealth conscious people of fall walks of life. Our Goal We strive for the best service and support to all clients by providing: quality products and workmanship, reliable service and backup, personal attention, centrally situated. Powered by The Find Fast Free.co Foundation, All rights reserved.